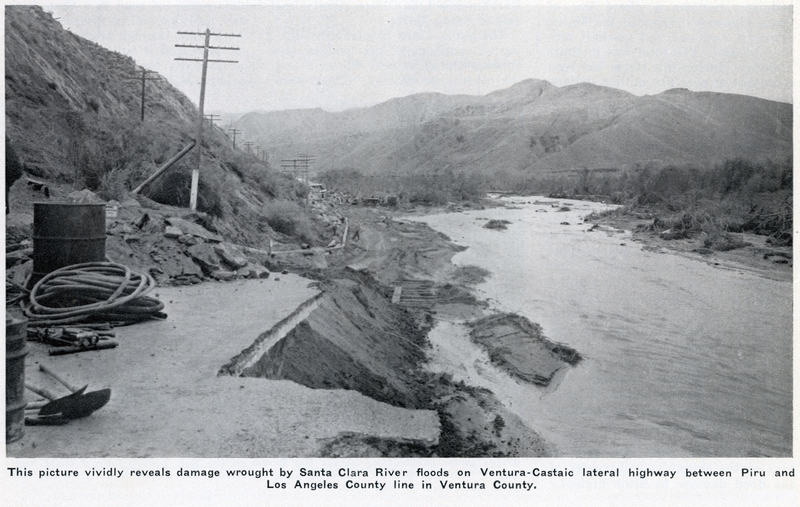 SCVHistory.com LW3356 | California Highways, April 1938: Great Flood of March 1938 Devastates Southland Highways, Bridges. Great Flood of 1938: March Storms Took Big Toll. California Highways and Public Works Magazine. Vol. 16 No. 4 | April 1938. Three separate storms during the period December 11 to March 4, damaged State highways and structures to the extent of $8,000,000. December and February storms took their heaviest toll in the northern part of the State, while the March storm concentrated on the southern section. The damage for the entire period, however, was almost equally divided between the two areas. December and March storms, which caused over 90 per cent of the damage, were of three to five days duration and brought rains of cloudburst proportions to the higher altitudes, while establishing record-breaking hourly and daily precipitation records in the valley and coastal regions. The March storm, which this article describes, swept in from a low-pressure area over the Pacific which extended from the Aleutian Islands south to a point about 800 miles west of San Francisco. Los Angeles, Orange, Riverside, Ventura, and San Bernardino counties suffered the brunt of its attack. LW3356: Magazine purchased 2018 by Leon Worden. Download individual pages here.